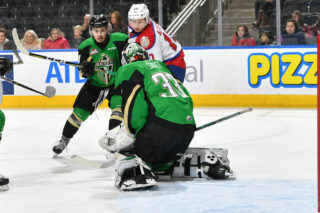 Make it back-to-back games a goaltender earned his first win as a member of the Edmonton Oil Kings. 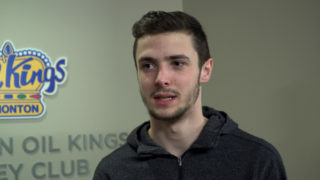 After Boston Bilous made a 20-save performance on Friday night to pick up his first ever WHL win, newly acquired Dylan Myskiw turned aside 28 of 29 shots on Saturday night to register his first win with the Club as the Oil Kings (2-0-0-0) defeated the Red Deer Rebels (0-2-0-0), 4-1, in front of 5,007 fans at ENMAX Centrium. 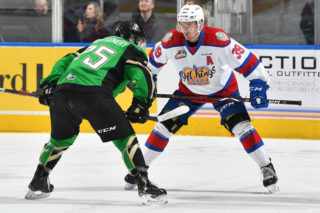 Over the first two games, Myskiw (1-0-0-0) and Bilous have teamed up to propel the Oil Kings to back-to-back wins to start the season for the first time since the 2016-17 campaign. Ethan Anders (0-2-0-0) was once again was busy in goal for the Rebels but was saddled with the loss, tonight allowing three goals on 34 shots. 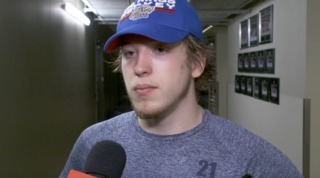 The Oil Kings opened the scoring as David Kope, from along the boards at the goal line deep in the Red Deer zone, fed Trey Fix-Wolansky for his first goal of the season. Jake Neighbours earned the secondary assist at 7:09 of the first period. With Red Deer on the power play they would tie things up, 1-1, as Alexander Alexeyev fired the puck on the Edmonton goal but hit the post. The puck then bounced off the back of Myskiw and into the back of the net. Dawson Barteaux and Jeff de Wit earned assists on the goal at 14:31. Through 20 minutes of play, shots favoured the Oil Kings, 13-11. 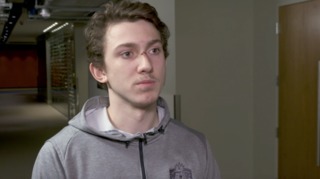 The hot hand of Vince Loschiavo continued on Saturday as the 20-year-old picked up his third goal of the campaign, outlasting Anders with a nifty backhand to give Edmonton a 2-1 lead. Fix-Wolansky and Wyatt McLeod picked up the helpers at 4:11, which also proved to be the lone goal of the frame. Shots through two periods were 28-17, Oil Kings. With under five minutes to play Kope made it 3-1 Edmonton, as the winger gloved down a high shot and batted the puck past the Rebels netminder for his first of the year, from Loschiavo and Wyatt McLeod at 15:41. With more than two and a half minutes to play Red Deer pulled Anders in favour of an extra attacker in an attempt to tie the game, but to no avail. Scott Atkinson would seal the 4-1 win for the visitors with his first of the season at 19:52, unassisted. 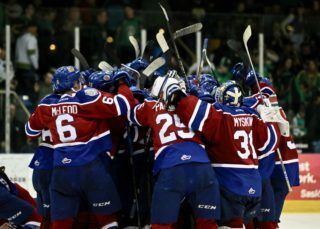 Final shots on goal saw the Oil Kings outshoot the Rebels, 35-29. Red Deer finished the night going 1-for-4 on the power play while Edmonton was 0-for-5 with the man advantage. Dylan Myskiw (EDM) (3), Alexander Alexeyev (RD) (2) and Trey Fix-Wolansky (EDM) (1) were selected as the Three Stars of the Game. Wyatt McLeod, Matthew Robertson and Conner McDonald each wore an “A” and skated as alternates to captain Trey Fix-Wolansky. The Oil Kings are back in action Wednesday, September 26 when they host the Medicine Hat Tigers for a 7:00 PM (MT) start at Rogers Place.